"The Peculiar Case of Formula 12," a new web series filmed in D.C., is a "retelling, a reimagining, of a classic science fiction thriller." WASHINGTON — Covered in bruises and scratches, a man named Henry is forced to meet with a court-appointed psychologist after allegedly being attacked by a group of muggers. 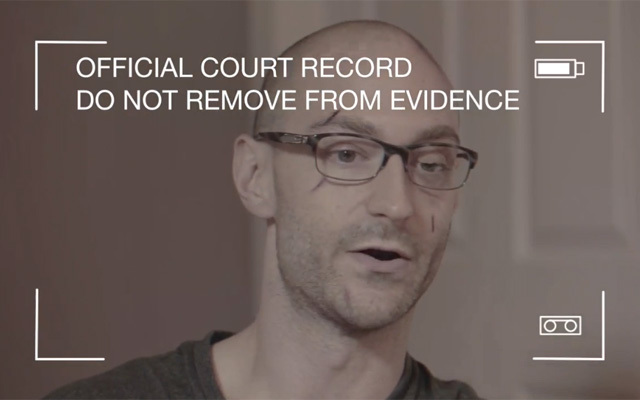 He recounts the brutal attack as a camera rolls on the interrogation. But as more details emerge about the incident, more questions are raised about what really happened that night. Welcome to the first episode of “The Peculiar Case of Formula 12,” a new web series filmed in D.C.
“The show is a retelling, a reimagining, of a classic science fiction thriller that pretty much everyone would know,” says creator, actor and director Andre Keuck. Without giving too much away, the series – filmed over three days in Northwest for less than $250 – tackles the familiar dangers of leading a double life. Henry, played by Keuck, gives one version of the attack to the psychologist, only to put all that into question later in the episode. “I’ve been seeing a lot of the same themes repeated over and over again, about someone who … starts off in one direction, kind of like Walter White in ‘Breaking Bad,’ and then over time evolves into this thing that he doesn’t even recognize at the end of it,” Keuck says. Keuck met his cast and collaborators years ago while attending George Washington University. Because everyone, including him, has day jobs, the crew was forced to scrunch filming into a long weekend. They used houses, apartments, empty offices and nearby alleys. Keuck’s neighbors were a little perplexed by all the lights and camera outside of his Bloomingdale home, but the cast wasn’t there long enough for anyone to complain, he says. The first season of “Formula 12” comprises six episodes that are all 3 to 6 minutes, a sweet spot for web viewers. The biggest challenge, Keuck says, was fitting in enough details to entice the audience without burdening them with too much explanation. This dilemma isn’t necessarily singular to Internet shows, but the medium does present particular problems. Keuck hopes to generate enough interest via his YouTube channel to perhaps get picked up by a larger network. At the minimum, he hopes to shoot a second season. Watch the full season of “The Peculiar Case of Formula 12” and follow the series on Facebook and on Twitter @WhatIsFormula12.